Filmmaking now divides essentially into two broad categories: blockbusters (no, I didn't know that the word is "a term coined in the 1920s to denote a movie whose long line of customers could not be contained on a single city block") or would-be blockbusters, and more serious films made by "independent subsidiaries" to earn Big Six corporations and their ranking executives "the awards, media recognition, artistic bragging rights and other non-economic rewards they sought in Hollywood." The blockbusters are aimed at children and teenagers and are scripted according to "the Midas formula," the ingredients of which include "a child or adolescent protagonist," a "fairy-tale plot in which a weak or ineffectual youth is transformed into a powerful and purposeful hero," "bizarre-looking and eccentric supporting characters that are appropriate for toy and game licensing," a happy ending "with the hero prevailing over powerful villains and supernatural forces" and "conventional or digital animation to artificially create action sequences, supernatural forces . . . and elaborate settings." In two words: "Harry Potter." In four: "Lord of the Rings." You can read the entire review by clicking here. The Goldberg Variations, by J.S. Bach, is a work for harpsichord, an aria and thirty variations, written for a musician (named Goldberg) whose insomniac patron wanted something to listen to while not sleeping. What an odd origin for such a remarkable work. I started listening to it in 1984, when my "girlfriend" (now my wife) introduced me to it via harpsichordist Trevor Pinnock's recording. We listened to it on cassette, walking around Boston and riding on the train, sharing a Sony Walkman with a special jack for two sets of headphones. My almost-lifelong interest in jazz (see below) made this work immediately congenial: what could be more appealing to a jazz person than the idea of variations on a theme? Pinnock's performance of the Goldbergs still sticks in my mind, but hearing pianist Glenn Gould's recordings in 2003 really opened up my ears. Gould recorded this piece in 1955, and his sharp, clear, modern conception of the music completely changed people's ideas about Bach on the piano. The 1955 recording was huge, and it's never gone out of print. Gould's 1981 Goldbergs (which turned out to be his last recording) is even better. Here Gould seeks to present the work not as a series of separate pieces but as a unified whole (held together by impossibly complex patterns of tempo from variation to variation). Musical analysis aside, the 1981 recording is art of such a high order that it prompts, in me, something like religious reverence--a sense that there's a lot more to life than one might have thought. The one jazz record that everyone should have (and someday will--it still sells and sells). I've been listening to this record almost my whole life, as my dad, a tremendous jazz fan, brought home a copy in 1959. My childhood comment on Miles Davis was "Sad!" --not a bad way to describe the mournful sound of his muted trumpet. Kind of Blue is more than "sad" though. It's a perfect recording, each of its five performances capturing musicians at their highest moments of genius and empathy. The album represented a new possibility in jazz, leaving behind the complex chord changes of bop and using simple scales and modes, not song forms, as a basis for improvisation. Everyone from the Allman Brothers to Phish has credited Kind of Blue as an inspiration for improvisational music. Like Gould's 1955 Goldbergs, it's a recording from a time when artistic accomplishment and commercial success were still pretty compatible. Of the seven musicians on the record--Miles Davis, trumpet; John Coltrane, tenor sax; Julian "Cannonball" Adderley, alto sax; Bill Evans, piano; Wynton Kelly, piano; Paul Chambers, bass; and Jimmy Cobb, drums--only Cobb is still living. Sometimes you catch on early, as I did with Kind of Blue; sometimes it takes much longer. I had not the slightest interest in the Beach Boys in my kidhood and teenagerhood--I was a Beatles fan, and never considered listening to a group who sang about cars and wore matching striped shirts. What did I know? I first listened to Pet Sounds in 1999 (33 years after the fact! ), when my curiosity was piqued by watching a documentary about Brian Wilson. In it, musician after musician spoke of Pet Sounds in terms of musical brilliance. I borrowed a copy from the library and listened. The songs seemed so short, ending before they had even begun. As I had long been listening almost exclusively to old blues and jazz, recorded with a minimum of "production," the lavish instrumental backgrounds and echo of Brian Wilson's studio-based art were quite foreign to me. But I kept listening, and listened at least a dozen times before the music made an impact--first musically, then emotionally. Then I understood what I had been missing, and I realized how much solace this music might have provided when I was younger. Pet Sounds is somehow the most difficult of these three recordings for me to describe. It moves from innocence to experience, beginning with hope for the future in "Wouldn't It Be Nice" and ending with the loss and isolation of "Caroline, No." The album is filled with unusual harmonies and unusual musical textures--bass harmonica, plucked piano strings, timpani. Aside from Brian Wilson's SMiLE (which would finally arrive 38 years later), Pet Sounds must be the most sophisticated pop record ever made. Pet Sounds is available as a single cd, with Brian Wilson's mono production and a Wilson-approved stereo mix. For diehards (and it's relatively easy to become one), there's Pet Sounds Sessions, with instrumental tracks, outtakes, alternates, and best of all, vocal tracks. The sound of the Beach Boys' voices a capella is one of the greatest sounds in music. Give a listen, and you'll understand the Doonesbury comic strip in which a dying man is grateful that he lived long enough to hear Pet Sounds reissued on cd. If I were to double this list, I'd add the Complete Recordings of Robert Johnson, the Beatles' Sgt. Pepper's Lonely Hearts Club Band, and Van Dyke Parks' Song Cycle. But that's enough writing for now. The latest version of this classic LP is reissued in a new 2-sided DualDisc format, which includes an audio version, 5.1 multichannel surround sound, studio outtakes, and a photo gallery. It also includes "Made in Heaven: The Story of Kind of Blue," a documentary about the legendary recording, featuring a wide array of musicians and fans, from Ed Bradley of 60 Minutes and rapper Q-Tip, to Shirley Horn, and Cobb (sadly, KOB's last surviving musician). A hard man to get to know, really. You don't realise at first, because he seems transparent, transparently charming. The charm of a marvellous listener: your seductive therapist, that doctor whose only focus in life is your pain. Never centre stage, always the supporting actor. He asks questions, he gets you to talk about yourself. You blossom in the intensity of his attention. You don't mind (if you notice) that you learn so little about him, because he seems so genuinely interested in you. And the next time, he remembers everything you said. "Interested is interesting": that's his secret for picking up women (and patrons). Who was Shakespeare? Five writers offer their answers. You can read them all by clicking here. 3703 students: Curiosity at 11:00 p.m. sent me to Advanced Book Exchange, a great used-book site, to see how our recent poets are doing. ABE lists books by price, so my curiosity took me to the last page for each poet. NY Objectivist Press (1934). A poem in seven parts. Inscribed by the author in 1975. Most pages uncut. Very near fine in like dust jacket. A very attractive copy. First edition of this rare landmark anthology which prints the work of Pound, Williams, T. S. Eliot, Bunting, Rexroth, Reznikoff, Oppen, Rakosi, McAlmon, Zukofsky, among others. . . . Presentation copy, inscribed on the front free endpaper: "a Fernand Leger cordialement Louis Zukofsky, 3 Sept. 1933, Paris". With two corrections by Zukofsky on pp. 25 & 153. . . . The number of copies printed is unknown, but it was probably no more than 300. . . . Wrappers lightly rubbed and soiled, but a very good, unopened copy of this rare anthology. Edinburgh Wild Hawthorn Press 1961. First edition of Niedecker's second book, published by the press of the Scottish concrete poet & gardener extraordinary Ian Hamilton Finlay, with the introduction by [poet Edward] Dorn on a separate sheet laid into the book. Inscribed on the inside front wrapper to her later publisher, Jonathan Williams: "Jonathan: My best book so far (Sept. 3, '69). So good of you to keep it on hand. Best wishes, Lorine". In 1968, Williams' Jargon Society published Niedecker's Tenderness & Gristle: The Collected Poems (1936-1966) & in 1985, the most comprehensive edition of her poetry, From This Condensery: The Complete Writings of Lorine Niedecker. In his introduction to My Friend Tree, Dorn deftly sums up Niedecker's achievement: "I like these poems because first they attach an undistractable clarity to the word, and then because they are unabashed enough to weld that word to a freely sought, beautifully random instance--that instance being the only thing place and its content can be: the catch in the seine". Inscribed books by the sybilline poet from Black Hawk Island on the shores of Lake Koshkonong, Wisconsin, are extremely rare. Paris The Black Sun Press 1930. First edition. One of 50 copies on Japanese Vellum, signed by Crane. Quarto, original white printed wrappers, with original glassine cover and gilt paper covered slipcase (cover and case lightly worn). A beautiful copy of one of the rarest and most important books of twentieth century poetry. ABE also lists many paperbacks by these poets that cost just a few dollars ($3, $4, $5). I was visiting New York last week and noticed something I’d never thought I’d say about the city. Yes, nightlife is pretty much dead (and I’m in no way the first to notice that). But daylife--that insane mishmash of yells, chatter, clatter, hustle and chutzpah that makes New York the urban equivalent of methamphetamine--was also a little different. It was quieter. Manhattan’s downtown is now a Disney-like string of malls, riverside parks and pretty upper-middle-class villages. But there was something else. And as I looked across the throngs on the pavements, I began to see why. There were little white wires hanging down from their ears, or tucked into pockets, purses or jackets. The eyes were a little vacant. Each was in his or her own musical world, walking to their soundtrack, stars in their own music video, almost oblivious to the world around them. These are the iPod people. These are the first paragraphs of an interesting short piece on one way that technology is changing social space (by a writer who admits that he too is a resident of what he calls the "iWorld"). You can read the rest by clicking here. Q. You had a large handbag with you at the [Yankees World Series] game. What was in it? A. A Hermes address book with an extensible very thin silver pencil; and two other pencils--a black ball-point (my name stamped in gold), retractable, made by a veteran who is paralyzed below the chest, who makes and sells a variety of eye-catchers as a living--Hal McColl, 101 West Club Boulevard, Durham, North Carolina. I occasionally order a pen set of him since it doesn't scratch or exude spiders. In case it gave out, I had a Dixon Ticonderoga with brass cap; had a Standard ring-topped notebook and a little thing of fifteen pages with a glazed white cover, souvenir of Unz & Co., Stationers, 24 Beaver Street, New York City--given me for a trip but saved for a single special event. Then I had a miniature pair of black plastic binoculars weighing an ounce and three-quarters--bought by mail to watch a bluejay that for two or three years had preempted a catalpa tree in a backyard adjacent to my back windows. I like to startle it by imitating it, so that it gives a sharp look round and answers uncertainly. It stays all winter. Question by man of letters George Plimpton, answer by poet Marianne Moore, from "Ten Answers: Letters from an October Afternoon, Part II," Harper’s (November 1964). I watched the entire Grammy broadcast this year, hoping to see Brian Wilson and Van Dyke Parks in the audience. Alas, the three categories in which their masterpiece SMiLE was nominated weren't even part of the broadcast. Brian Wilson did make an appearance in a ramshackle "all-star" version of "Across the Universe," which was immediately offered for sale across the universe in the form of an iTunes file. Two: The lip-service paid to dead musicians (such as Jelly Roll Morton) and living musicians (such as Pinetop Perkins) whose work will never be a part of the show. Four: The virtual disappearance of whole areas of music. Classical music and jazz were never more than peripheral in the past, but now winners in those areas (and many others) aren't even announced from the stage. 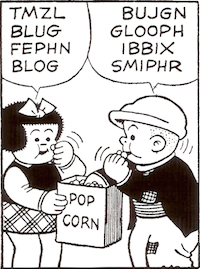 Instead, their names flash at the bottom of the screen, so unobtrusive that they're almost invisible. Two albums were, to my mind, sadly overlooked at the Grammys. In 2004 Brian Wilson released a newly-sequenced and newly-recorded SMiLE, the epic of American innocence and experience that was to have been the followup to The Beach Boys' 1966 Pet Sounds. SMiLE never happened back then, ending up as an abandoned, unreleased Beach Boys album and the greatest "lost" recording in pop music. For BW and lyricist Van Dyke Parks to have brought SMiLE to completion 38 years later makes for a human interest story that's hard to match. And in its music and lyrics, SMiLE is extraordinary. It's received rave reviews and has sold a respectable 300,000 or so copies (maybe more by now). I really was hoping (always the optimist) that the Grammys would recognize that 2004 was, among other things, the year of SMiLE. That would have been a sweet finish to an amazing chapter in The Brian Wilson Story. But SMiLE won only a single Grammy, for best rock instrumental ("Mrs. O'Leary's Cow"). For many listeners, though, SMiLE was the album of the year, 38 years later. My other album of the year is Nellie McKay's Get Away from Me, a debut "double-album" (18 songs on two cds) by an inspired songwriter-singer-pianist. McKay (pronounced "mc KYE") has been compared to Eminem and Doris Day, but such comparisons are hype rather than accurate description. McKay is in truth a writer of funny, sharp, poignant lyrics, a composer of very memorable tunes, an accomplished pianist, and a singer of great flexibility who's well acquainted with pop, rock, hip-hop, and jazz idioms. (And she sings on pitch!) She is, as her album title suggests, something of an anti-Norah Jones, a performer whose energy and quirkiness could never work as bookstore background-music. You can find links for Brian Wilson, Van Dyke Parks, and Nellie McKay to your right on the sidebar. It is easy to spot Alex’s assigned reading books among his real books. His real books are worn, and cling to a driving force, namely Comedy. These books are stacked and bulging in his shelves, all the novels by Louis Sachar, Daniel Pinkwater, Barbara Park. And then thicker books—the biographies of Milton Berle, Sid Caesar, Larry Gelbart; all the scripts from Our Show of Shows; the script of A Funny Thing Happened on the Way to the Forum; a book called 170 Years of Show Business. But mostly his library serves to illuminate and honor Mel Brooks, his hero. Anyone interested in what passes for lit in schools today (i.e, the "problem novel") will want to read the entire essay, which you can find by clicking here. Many tribes are patrilineal, meaning children are considered the father's descendants and men are seen as the sole property owners in the family. If her husband dies, the wife may be allowed to stay in the couple's house--but, sometimes, only on condition that she marry one of her husband's relatives. If she wants to move, perhaps back to her own family, she typically leaves with nothing but the clothes on her back. Or she may simply be driven out altogether. Increasingly, in-laws cite the possibility that a widow is infected with the AIDS virus as reason to confiscate her home. I am looking to make a sacrifice for the benefit of the April 5, 2005 election and understanding that I will be retaining the right for me and my qualified supporters to circulate future petitions so that I can pursue a future election in approximately two years or any election thereafter, to a position as a member of the [Name] Community Unit School District so long as I am a resident of that school district and otherwise qualified. Note the unnecessary legalisms: "retaining the right," "qualified supporters," "any election thereafter." Translation: Now is not the best time for me to run, but I might run again in a few years. 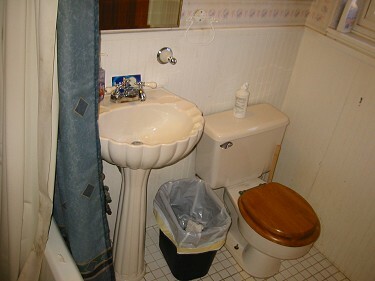 3703 students: Here are three links to photographs of sinks that more or less resemble what we saw in "To My Wash-stand." It's difficult to tell whether these are really old or only faux-old. I found them by typing old bathroom sink in Google. Here they are: the first, the second, and the third. Notice the old-style tile floors in the second and third photos. The feminine counterpart of this term is misogyny, and hatred of humankind is known as misanthropy. "Television advertising, for example, is deeply infected by misandry. In adverts for everything from jeans to yogurt, men are portrayed as idiots." John Waters; A Hate That Dares Us to Breathe Its Name; Irish Times (Dublin, Ireland); Nov 25, 1997. "Shall we build with jelly packets?" "I can feel his head in the back of my head." "After everyone left the room, I sat down and went through Ron's final presentation in slide-sorter view," Williams said. "Man, I gotta tell you, it blew me away. That presentation really utilized the full multimedia capabilities of Microsoft's PowerPoint application." "We're really gonna miss Ron around here," Williams added. From The Onion, "Project Manager Leaves Suicide PowerPoint Presentation." You can read the article by clicking here. Thanks to my friend Norman for "pointing" me to this article. 3703 students: You can read Marjorie Perloff's deeply thoughtful and deeply critical review of Cary Nelson's Anthology of Modern American Poetry by clicking here. Please submit a paper for [name withheld], an International journal . . . . Please visit the journal's website. The journal must be unique in the world of English studies in having an Angelfire homepage. It's probably also unique in having images of foxes (wolves? ), polar bears, and walruses on its homepage. An individual copy costs $30 ($50 if you're a library). A $10 "processing fee" must be included with one's essay, the check made out not to the journal but to an individual. There is no indication what sort of essays the journal is seeking. My best guess is that it's seeking essays accompanied by $10 checks. Best of all, submitting authors are asked to name two people to serve as referees. Not what one usually means by "refereed journal"! I can't decide: Is this a scam in which you hand over your money and get "published"? Or does the "publisher" simply take your money and disappear? Either way, this lit crit scam is a welcome diversion from the usual junkmail. At least these people know that I teach English, unlike the Nigerian barristers who are always knocking at my e-mail door. One more suggestion: the Hipster PDA. That is, a stack of index cards held together with a binder clip. The ways in which people have worked out the details of this analog organizing tool are pretty amazing. Google returns close to 10,000 hits for "hipster pda." I've added a number of links to the column on the right. Big deal, eh? To me, it is though--I'm happy to have learned how to do so. 1. A style of painting in which objects are rendered in extremely realistic detail, giving an illusion of reality. 2. A painting, mural, etc. made in this style. "Good trompe-l'oeil work is magical. It persuades you that the subject of the mural is real, that you are indeed seeing a view of smoking Mount St Helens, or a formal baroque garden glimpsed through a filigree-screen gateway, or a stretch of beach on a windy day." Stephen Anderton; When We Practise to Deceive; The Times (London, UK); Jan 4, 2003. There, in an extreme form, is the project of the "beautiful illusion" that William Carlos Williams rejects. WCW on Shakespeare: "He holds no mirror up to nature but with his imagination rivals nature's composition with his own." Alan Speer died Sunday at a swim meet in Michigan. He was 34, a Charleston kid who grew up into a witty, learned man. He knew more about film than anyone, and I mean that just about literally. My wife Elaine, who taught Alan flute, was close to him and remembers a story that he once told her. In his high-school days, Alan went to Turkey as an AFS student and, of course, learned Turkish. Years later, in his grad-school days, he was riding in an elevator when the two other passengers, both young women, began giggling and talking about how cute he was. Here's the good part: they were talking in Turkish, never imagining Alan could understand them. He stood there taking it all in, and when the elevator stopped at his floor, he turned to them, said something in Turkish, and left. I wish I could remember what it was he said (Elaine can't either). "I heard every word"? "Thank you"? "I agree with you completely"? Whatever it was, I'm sure it was smart and funny and kind, like Alan himself. Alan's writing on film is plentifully available online. His webpage for his film criticism, Cinemadox, can be found by clicking here. [W]e learned that the White House is banning the use of the term "privatization"--the key principle behind its push to overhaul Social Security--because focus groups distrust the word in the wake of Enron and other corporate scandals. Instead, the administration is encouraging the use of the phrase "personal accounts," a friendlier, warmer and fuzzier term. A number of news stories have posited the same rationale behind the push for Social Security "reform" rather than "privatization." Linguist Christopher Moore scans the globe in search of words that are not easily translatable into English. In the Republic of Congo, for instance, he found ilunga, which 1,000 translators deemed the world's most untranslatable word: As best as they can describe it, it means "a person who is ready to forgive any transgression a first time and then to tolerate it for a second time, but never for a third time." There is also the Czech litost (pronounced lee-tosht), meaning "a state of torment created by the sudden sight of one's own misery." And the beautiful French idiom esprit de l'escalier, which refers to the clever reply one thinks of only afterward, in this case, on the way down the stairs after having made a remark in an upstairs room. Grad's article was inspired by a story on National Public Radio, which you can read about and listen to here. Humans specialize in distraction, especially when the task at hand requires intellectual heavy lifting. All the usual "Is it lunchtime yet?" inner voices, and external interruptions like incoming phone calls, are alive and well. But in the era of e-mail, instant messaging, Googling, e-commerce and iTunes, potential distractions while seated at a computer are not only ever-present but very enticing. Distracting oneself used to consist of sharpening a half-dozen pencils or lighting a cigarette. Today, there is a universe of diversions to buy, hear, watch and forward, which makes focusing on a task all the more challenging. Recommended to all college writers: The Nuts and Bolts of College Writing, by Michael Harvey. A mere 100-odd pages, it's the clearest, most helpful presentation of sound writing advice I've seen. And at $4.95 (plus $3.00 shipping), it's a bargain. For whatever reason, Google no longer finds the link to a post that mentioned my now-retired dad's tile business, Leddy Ceramic Tile. I would like for Leddy Ceramic Tile to be part of the online world. So this post is dedicated to making that happen. My hope is that anyone looking for "Leddy Ceramic Tile" will find it here. Leddy Ceramic Tile. Leddy Ceramic Tile. Leddy. Ceramic. Tile. The facilitator of the focus group will be [Name]. Here are the sorts of nouns that writers turn to to dress up what they have to say. Focus group comes to us from the worlds of market research and political analysis, where people are chosen to form a cross-section of a much larger population. If people are showing up without being selected, they might have a wonderful conversation, but they won't form a focus group. Facilitator is a noun without clear meaning. To facilitate is to help bring about or make easier. So what might a facilitator in this context do? Send invitations? Encourage people to attend? Reserve the room? Arrange for refreshments? How might things be said in clear, precise language? [Name] will lead the discussion. An active verb instead of to be; four words instead of eight; six syllables instead of thirteen. Over 50% off! Tomorrow is the first day of the Chinese New Year. Happy New Year. 2005 is the Year of the Rooster. For more about the Chinese calendar, click here. Now that's a sign befitting a university campus. 3009 students: Slavery and the Making of America airs on WILL-TV in two two-part installments: Wednesday, February 9, 8:00-10:00 p.m., and Wednesday, February 16, 8:00-10:00 pm. Watching any or all of it would give you some extremely helpful background for Adventures of Huckleberry Finn. You can learn much more about this series here. 3703 students: For a tremendous archive of RealPlayer files, via the Factory School, click here. You can find H.D., Eliot, Frost, Pound, Williams, and almost 200 other poets. I decided to pop for a copy of Tufte's essay . . . . We translate a lot of PowerPoint presentations and I have had to sit through my share as well. The only good one was last November at a conference. A professor of linguistics used PP slides the way we used to use handouts (i.e. he did not read his presentation from the slides). Needless to say there were no bullet points. The Cognitive Style of Powerpoint is available here. And for the ultimate in PowerPoint satire, Peter Norvig's famed PowerPoint version of Lincoln's Gettysburg Address. Various modern poems have been turned into comic books (most famously by Dave Morice), but only one (to my knowledge) has been turned into a full-blown graphic novel. 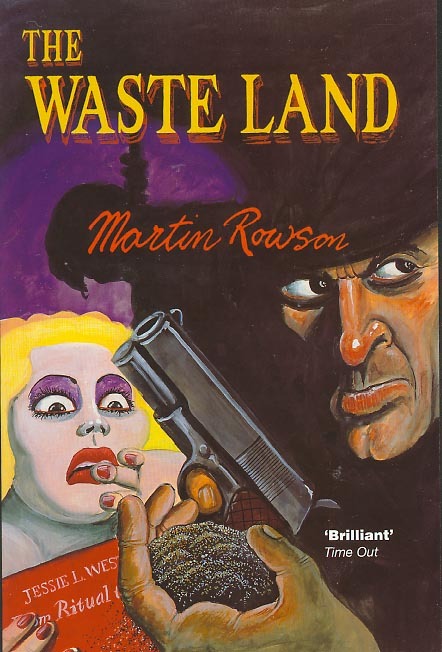 For the original and more recent covers of Martin Rowson's The Waste Land, click here and here. Rowson turns The Waste Land into a film noir detective story. From the poem "November 23," in The Daily Mirror. 3703 students: Here's a link to the Paris Review interview with William Carlos Williams.